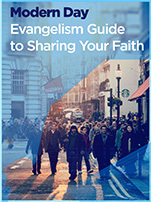 Sharing the good news is something we as Christians were instructed to do from the master evangelist himself. So what does this look like today? We have looked at how Jesus did this over two thousand years ago, but things have changed, right? Our culture is a lot different, modern, technology driven, big box stores on every corner. I think there are a few things we can do to bring this to life in our everyday lives. The first thing we must do is truly be led by the Holy Spirit throughout our entire day. This might start with a simple prayer in the morning asking the Holy Spirit to direct your day according to what He wants, not necessarily what you want. It could also entail carving out a few minutes for your quiet time of reading God’s word, praying and worshiping our Creator so He has the opportunity to speak to you and provide direction for your day. Often times our quiet time’s are filled with us speaking to God and not enough time of God speaking to us. The challenge is keeping God’s presence after you’re done with your devotional time, after you pray and maintaining it when you enter the busyness of your day. It means you are actively listening in your spirit so if He speaks, you hear and obey as you go about your day. Personally, I have been led by the Holy Spirit to do some strange things sometimes. Recently, I was leaving the gym and the Holy Spirit told me I needed to go to Target, more specifically, the card section within Target. This was around Valentine’s Day so I really did need to get my wife a card and so I was thinking this wasn’t too strange. As I was driving over there He hinted that there might be someone in the card section that I should hand out one of our gift cards to. So I went to the card section and there was nobody else there. I started browsing for a card, waiting anxiously, to see if anyone would show up. 5 minutes go by and it’s still just me. 10 minutes and no one. Finally, I am like I have to get back home. So I paid for my card and drove home. During the drive I obviously was asking God if I had missed something or someone as I was pretty confident He had wanted me to take that detour. I would soon get my answer as I pulled into my neighborhood and remembered I needed to mail a package. As I pulled in I noticed our mail lady pulling out so I ran inside, grabbed the package and went to find her. Luckily, she was only one neighborhood over and I pulled up next to her, got out and handed her my package. As I was walking back to my car the Holy Spirit spoke to me clear as day and told me I needed to give her one of our gift cards. So I grabbed a gift card from my wallet and walked back over to give her the card. Then it hit me that this was exactly what God had wanted me to do. Had I not gone to Target, waited around a few minutes and then came back home at the exact time, this encounter would of never happened. What’s even more amazing is that this encounter eventually turned into something much more. Later on I took the opportunity to actually talk to my mail lady, Kathy, and hear a little bit about her story which I hope to share with you all one day. It was not pretty, and she had been going through a lot of stuff. What is amazing is that she just sat there and shared it all with me, a complete stranger, because I had taken the time to create an encounter with her . After she poured her heart out, I asked her if I could pray for her and I did. Kathy will forever remember that day when a complete stranger took a few minutes of their busy day to show her a little love and represent what it truly means to live like Christ. That is how God wants to work in our culture today, but most of the time we are not in tune with Him. Another thing we must do is simply be aware of our surroundings and environment. Yes, there is a world outside of our iphones and it’s time we as Christians become active participants in it. If we truly want God to create opportunities for us to save the lost in this world then we have to at least be looking for them instead of the last text we just got or the Instagram photo one of our friends just posted. No lives will be saved or opportunities created when we are not paying attention to those around us. I could go on, but it’s truly that simple. We have to be engaged to engage those around us! The last thing we must do is abandon our “nets” or worldly pursuits. Two fishermen (Simon & Andrew) literally walked off the job to follow Jesus. Now I am not telling you to do that, but I am telling you that if you truly want to follow Jesus and be fisher of men then you must not be consumed with the things of this world. He must be your highest priority! Can you imagine what our lives would look like if we followed the idea that we can only take to heaven what we give away here on Earth (time,money, talents, etc..)? That is pretty radical and definitely counter culture, but it is clearly the message I get from Jesus and His word. What things can you do in your own life to become a Fisher of Men?